Cozy up, Spring is almost here say’s the Ground Hog. February marks the shortest month of the year and the arrival of longer, warmer days and the early signs of Spring. 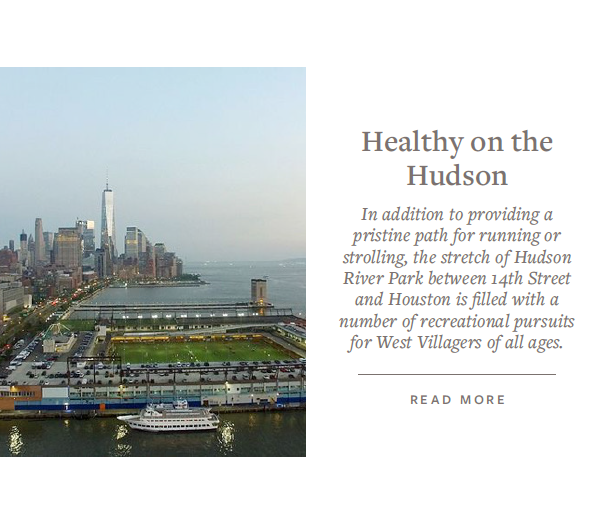 February’s Culturally Inclined has turned its focus to West Village; a.k.a. 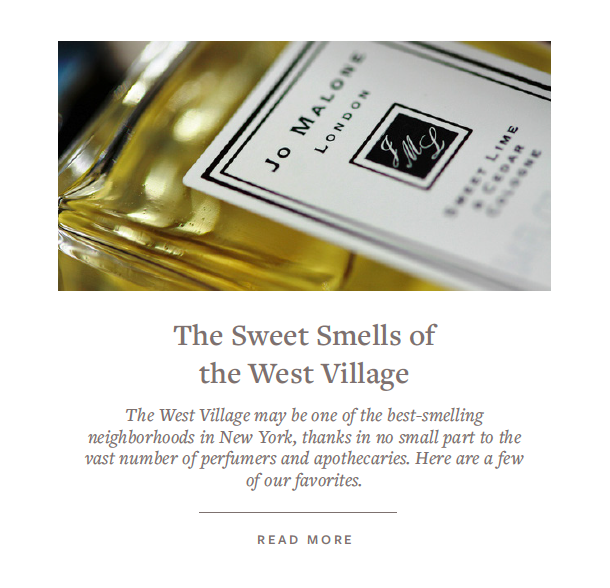 “The Village” exploring its Historic Homes & Streets, Recreational Pursuits, Whitney Museum, Perfumeries and Apothecaries, Jazz and much more! 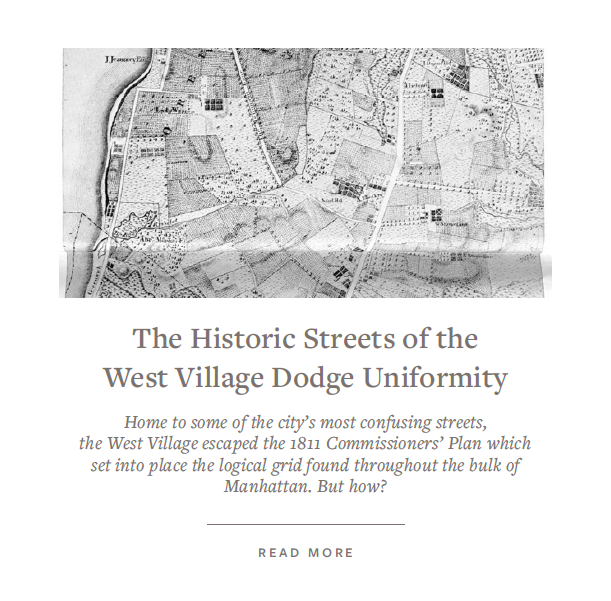 The charm of the area will be preserved because of a geological quirk, the famous Manhattan “rock” foundation, easily reachable in Midtown and in the Financial District area, lies very deep in the area. Building very high would either be expensive or dangerous. The result is a lovely, mostly low- and mid-rise neighborhood dominated by 19th and early 20th-century brownstones, townhouses, and small apartment buildings. The West Village bordered by Broadway to the east, the North River (part of the Hudson River) to the west, Houston Street to the south, and 14th Street to the north, and roughly centered on Washington Square Park and New York University. 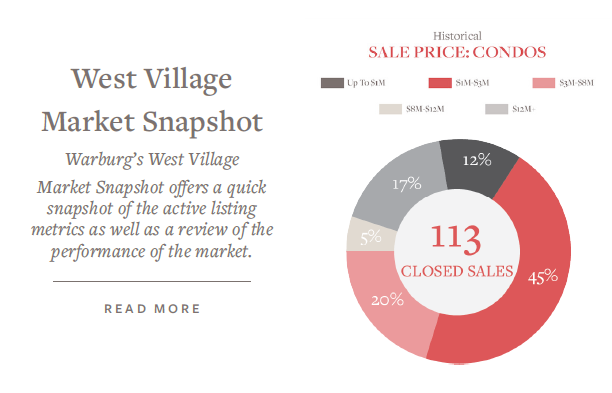 Of the Historic Districts in New York City, which has been designated or will be designated, Greenwich Village with nine outranks all others per the Historic District Designation Report, Extension Report and 2017 Greenwich Village Historical Society Report. This “supremacy comes from the quality of its architecture, the nature of the artistic life within its boundaries, and the feeling of history that permeates its streets”. 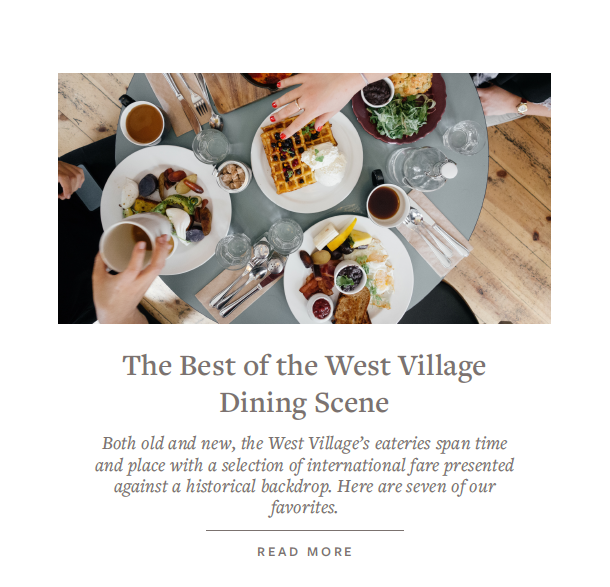 This time of year, as you ramble through the enchanting 18th century angular streets and breathe in the smoky aroma from the townhouse fireplaces transport your senses to the areas lush past. While the Village is best known for literary and art culture in the 16th century, Native Americans referred to the Northern area as Sapokanikan (“tobacco field”). The 1630’s, the Dutch turned the area into pasture and freed African settlers and named their settlement Noortwyck (“North district”, equivalent to Northwich/Northwick). In 1664, the English conquered the Dutch settlement and Greenwich Village developed as a hamlet separate from the larger New York City to the south on land that would eventually become Lower Manhattan. The earliest known reference to the village’s name as “Greenwich” dates back to 1696, in the will of Yellis Mandeville, a large Dutch land owner of Greenwich; however, the village was not mentioned in the city records until 1713. In the early and mid-twentieth century the Village, due to its resident’s progressive attitudes became the hub for “American bohemian culture”. The area teemed with new political and artistic thoughts when small presses, art galleries, and experimental theater flourished. The Village again became important to the bohemian scene during the 1950s, when the Beat Generation focused their energies there. Fleeing from what they saw as oppressive social conformity, a loose collection of writers, poets, artists, and students (later known as the Beats) and the Beatniks, moved to Greenwich Village. 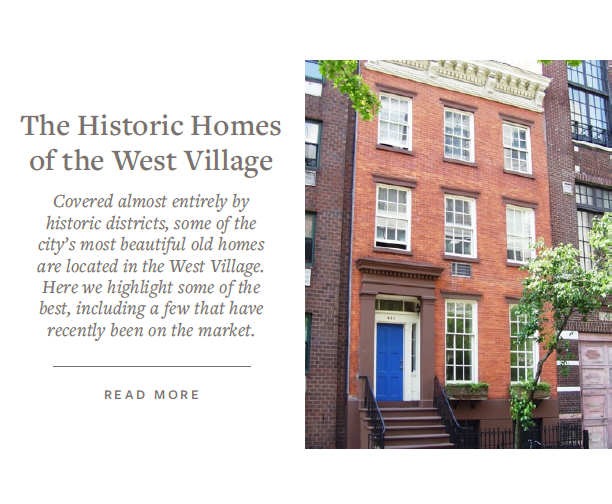 The West Village is a beautiful place to meander and contemplate the different eras from past to present. 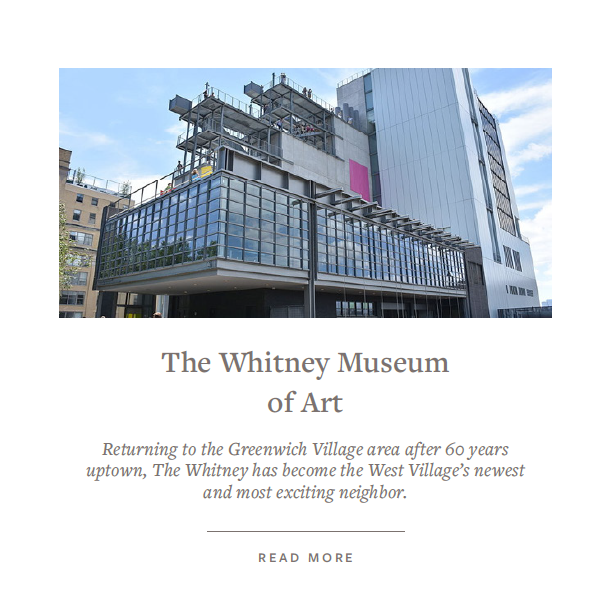 As you admire architecture, the West Village is diverse with old brownstones and revitalizing beautifully built buildings such as the Printing Press, Shephard, 150 Charles, Greenwich Lane (old St.Vincent Hospital) and a few new modern ones designed by Richard Meier on Perry Street and 111 Leroy. Amidst the new is the oldest house remaining in Greenwich Village, the Isaacs-Hendricks House, at 77 Bedford Street (built 1799, much altered and enlarged 1836, third story 1928), Aaron Burr the third Vice President lived on 17 Commerce, on 75 1/2 Bedford Street is the narrowest house 9 feet 6 inches (2.9 meters) wide built in 1883 whose famous residents were Cary Grant to Edna St. Vincent Millay, recently Landmarked David Chipperfield’s six story roman brick building on 11 Jane Street, and others highlighted homes can be discovered in the “Historic Homes of the West Village” section below. This month Mansions Global highlighted that the super wealthy buyers are combining adjacent townhouses for more space (click on link to view the article): Mega-Mansions Are Popping Up In Manhattan’s Greenwich Village. 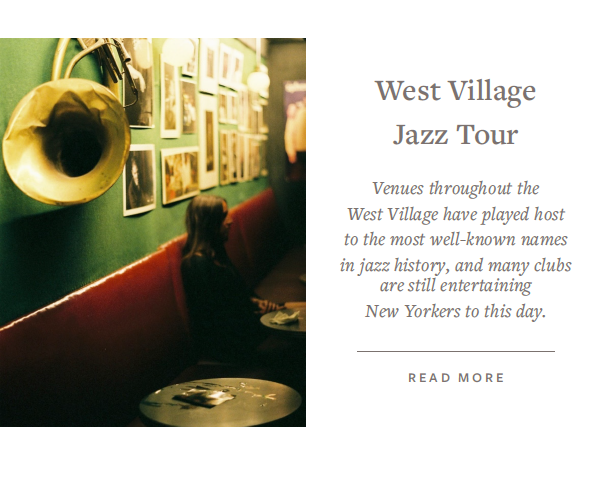 Enjoy exploring the West Village’s storied past. Take in the vibe at one of the award winning restaurants (West Village restaurants) and listen to a Jazz set or two followed by a trip to Chumleys hidden on 86 Bedford Street between Bedford and Barrow Streets. Chumleys was an old speakeasy recently renovated. In the back of Chumleys there used to be another entrance, a small passage way. This courtyard called Pamela Court has not been operational since 2007, it nonetheless retains its lore amongst New Yorkers’. The building has served many functions, first a blacksmithery and later a stop on the Underground Railroad before the Civil War, an a place for leftist. The great literary greats hung out in the speakeasy founded by Leland Stamford Chumley in 1922 during the prohibition ear and later the Lost Generation and Beat Generation movements. It’s a literary landmark. In honor of President’s Day, I leave you until next month with a quote from President Obama “One voice can change a room. And if one voice can change a room, then it can change a city. And if it can change a city, it can change a state. And if it can change a state, it can change a nation, and if it can change a nation, it can change the world. Your voice can change the world.” I aim to be the change so let me know if ever I can be of service to you or someone important to you.